Join this safari with Natureways Safaris on the banks of Zambezi River. You will enjoy the services of a fully-qualified professional guide who as well as guiding clients on the Zambezi River, can take clients for guided walks or game drives through the national park. Animals seen on this safari usually include elephant, buffalo, impala, waterbuck, hippo, crocodile, and plentiful birdlife. Lion, leopard, painted hunting dog, etc. are more rarely seen but are certainly in the area. Policy for children: Children from the age of 14 years are allowed to participate under the supervision of a parent or guardian. Camp Zambezi is a static camp (a mobile camp that does not move) offering rustic luxury set up on the bank of the mighty Zambezi River. The camp is set up and taken down by the staff to ensure that guests spend as much time as possible doing safari activities or simply enjoying their surroundings. The team will take care of all the guests’ needs and camp chores. During the mobile safari, the camp will be taken down and all equipment and guest luggage will be transferred to the next campsite by vehicle. All camping equipment is supplied. This is a true bush camp, but offering a little rustic luxury service. There is no electricity or plumbing and there are no permanent structures. It is a taste of the way a safari used to be, a truly authentic, African bush experience. Camps are eco-friendly, designed to be erected and dismantled within hours, leaving no trace on the environment. Natureways has custom-built tents to guarantee your comfort. It is a spacious walk-in style tent supplied with en-suite toilet facilities for night-use and comfortable beds with fresh linen. Stationary camp tents are mosquito-proof with mosquito gauze rooves so guests can lie in bed and enjoy the night sky. (All tents have fly sheets to ensure no one gets wet if it does rain! It also provides shade should one want an afternoon sleep). The camps are fully equipped with a mobile kitchen run by an experienced bush cook, bar facilities, and a dining area with full waiter service. Further, the camps have no permanent ablution facilities. However, camps are served by the luxury of long drop toilets and, for night-use, all tents have en-suite chemical toilets. You can also revel in a luxurious hot shower underneath the star-studded expanse of the African sky. This safari is a fully backed-up safari. It means that clients can sit back and relax while everything is taken care of. Natureways Safaris takes a minimum of 2 and a maximum of 8 people (special arrangements can be made for larger groups upon request). The minimum age limit is 14 years, there is no maximum age limit but common sense should be used. No previous canoeing experience is necessary but guests are required to be reasonably fit and healthy. There is no maximum luggage weight, as luggage will be transferred by vehicle from camp to camp. Natureways Safaris cannot guarantee plenty of game while on safari, particularly during the green (rainy) season. Guests can experience the full range of safari activities including game drives, canoeing, and walking. With no set of an itinerary, each trip can be customized to the expectations of each individual group. Games drives are in open 4x4 Toyota Land Cruisers. These drives may take you away from the river, to investigate the different inland habitats and the diverse occupants that make up the ecology of the area. Walking to explore and learn about the area with your professional guide, it is the best way to experience the incredible diversity of animals, insects, and flora at Mana Pools. The guide carries a weapon at all times. Mana Pools can provide some amazing experiences if guests are looking for close encounters with game. Mana is famous for its bull elephants, and if you are lucky enough to encounter one of these gentle giants on foot, it is an experience never to forget! 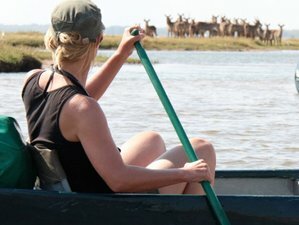 Canoeing is a wonderful way to take in the tranquillity of the bush, gliding past herds of animals which often unaware or uncaring of your presence. Canoeing is done in 5.5-meter (18-feet) Canadian-style canoes, fitted with comfortable seats and cushions. Natureways Safaris is only too happy to cater for guests with any particular special interests such as birding, photography, botany, etc. Please advise if you have any special interests prior to arrival. Ideally, each guest should have his or her own set of binoculars to maximize the safari experience. Fishing is also a popular activity in Camp Zambezi particularly towards the end of the dry season from September to October when the tiger fish are biting. Camp Zambezi is the perfect launch point each day for the fishing enthusiasts. You can canoe out from the camp each day and explore some of the islands and channels and spend the whole day fishing if you like, without the pressure of having to get to the next canoe camp down a river, as per a canoe trail. Fly by air-charter into Mana Pools National Park where you will be met by your guide with ice-cold drinks. You will then embark on a half-hour drive through Jesse bush and mopane scrub to Camp Zambezi arriving in time for lunch. You may, by then, already have met a few of your new neighbors such as an elephant, kudu, zebra, impala, and many birds! A mobile tented camp will have been set up by the camp staff. It is equipped with walk-in mosquito-proofed tents with en-suite chemical toilet, external long-drop toilets, hot showers, and a dining area next to the fire where iced drinks and sumptuous bush-prepared meals will be served. The chef will have prepared a delicious lunch to give you strength for the first afternoon’s walk, a familiarization walk to see the lay of the land. Then, go back to the camp for sundowners, a hot (or cold if you prefer) shower, and a fine dinner. Although it is tempting to stay awake to listen to the neighbors going about their nightly activities, the beds are very comfortable and warm so it may be difficult to stay awake! To make the most of your day, Natureways Safaris suggested an early morning wake up. The hand basins outside each tent are filled with hot water before first light to allow you to shave or freshen up. Go straight out to check for spoor and animal activity around camp. Enjoy a beautiful sunrise and, on your return to camp, a light breakfast will be served with tea and freshly brewed coffee. After breakfast, set off on your morning’s activity, you may take to the river for the day (or morning), go by vehicle or on foot to explore the national park. Whether you opt for land or water activities, half or full day, you can be assured of incredible experiences. The guide will carry a weapon, a first aid kit, a packed lunch, and extra water. Clients may carry extra personal water and personal items for the day. Finally, go back to the camp for the night where a wonderful meal, hot shower, cold drinks, and friendly staff are waiting. Another day along the lines of day two, the choices are yours to make the most of this amazing spot. This third night will again be spent at Camp Zambezi, with all the trimmings. Depending on your departure time, or if you are moving on to a canoe trail or an alternative camp, you may either take another early walk before breakfast or have a bit of sleep in! After that, there will be a game drive to the airstrip or to Nyamepi, a Mana main camp, where the team will bid you farewell! As you depart with your memories, Natureways Safaris knows that this experience will have enriched your life and touched your soul! This itinerary is just a guideline and may change due to unforeseen circumstances such as weather conditions. Walks are dependant on animal and weather conditions at the time and there will be a backup vehicle available if required or if clients do not want to walk the entire distance between camps. All participants are expected to sign an indemnity form upon arrival in Mana Pools. Failure to do so will result in cancellation of the safari. Elijah or E.G. as he likes to be called as has been with Natureways Safaris for 5 years and has embarked on his career as a canoe guide with the company. Recognizing his enthusiasm for the bush and wildlife Natureways Safaris is nurturing his passion and assisting him to achieve his goal of one day becoming a professional guide. Until then, E.G. works as the team leader in Mana Pools while trying to achieve his 1,000 hours of canoeing necessary to become a qualified canoe guide. James is Zimbabwean born and raised. From a very young age, he showed a keen interest in the outdoors, preferring to play with skeletons and birds nests rather than toys. This love of nature was developed at school and upon leaving, he started his safari career in Hwange National Park with Touch the Wild safaris. James joined Natureways in 1991 under the tutelage of Garth Thompson. He attained his canoe license in 1992 and his full professional guide status in early 1993. James has been in Mana Pools for 13 years and countless guests have benefited from his knowledge and passion for the bush. Mana Pools National Park extends along 80 kilometers of the Zambezi River, making for the best game viewing on the lower Zambezi. Mana Pools is the only game park in Zimbabwe to be granted World Heritage status and encompasses some of Africa’s largest areas of acacia and mahogany woodland, combined with spectacular, full canopy mopane forest. Mana is part of a 300 million-year-old rift valley, supporting a large variety of mammals and over 400 bird species. The over 200-square kilometer of this park has been set aside to be kept as wild as possible with only non-invasive, zero-impact tourism allowed. Here, one can participate in canoeing, walking and / or game drives or simply relax and take in the breathtaking beauty. Mana Pools is consistently rated in the top ten of Africa’s national parks. Here, there are no safari lodges, generators, electric fences or other structures often associated with safari camps as these are banned by law. All camps must be taken down the day after clients depart to ensure minimal damage to the ecosystem. Wildlife is abundant in the valley especially from June through late October. The Zambezi runs through the Urungwe Safari, Mana Pools National Park, Sapi Safari, Chewore Safari, and Dande Safari areas respectively. The most common animals in this area are impala, waterbuck, hippo, crocodiles, elephant, and buffalo. Animals such as lion and leopard are more difficult to find but are certainly present. Wildlife is more abundant in Mana Pools, especially during the height of the dry season (July to October) when the game viewing can be fantastic. All products are brought in fresh and meals are prepared in camp by one of the famed bush cooks. All slices of bread and pastries are freshly baked on the open campfire. Vegetarian or other dietary preferences can be catered for you but it is advised that you must inform Natureways Safaris 14 days prior to the safari. Breakfast may consist of cereals, yogurt, muffins, biscuits, pancakes, toast, and jams. On the last day of safari, a full English breakfast will be laid on for clients to enjoy. Lunch is usually fresh quiche, lasagne or similar with a varied selection freshly baked bread, salads, and cheeses. Dinners are full 3-course meals with various starters, delicious main courses and sumptuous deserts all eaten by candlelight under the stars, accompanied by an imported bottle of wine. All safaris include a supply of local beers, spirits, imported wines, minerals, cordials, mineral water, tea, and coffee. Drinks are served by the friendly camp staff while you relax. You are recommended to contact Natureways Safaris if you have any drink preferences i.e. if a particular brand of local beer is preferred. You are also free to bring your own beverages, and cooler boxes can be set aside for this purpose. There is no limit to a number of beverages you may bring. There is the option of going for an early morning walk or game drive before breakfast or, for the avid fisherman, there is time to pull out a rod. Natureways Safaris is a well-established operator in Mana Pools, which offers an authentic and unique opportunity to experience the real flow of Africa. 0 to 5 years of age: One child is free of charge, a second child is charged with 50% of adult rate. 6 to 13 years of age: 50% of adult rate. 14 years of age and above: full adult rate. This safari runs at a minimum of 4 pax between December 1 to March 31. Private safaris can be arranged if you book a package with a minimum of 4 people.